The growing dental practice in Melbourne, Florida, wanted a fresh look. A look that not only compliments the advanced treatment options they offer, but their state-of-the-art facility that is opening soon. The site has been developed in WordPress and offers Wickham Dental Care easy site management, and the flexibility to add more features as the practice grows. Custom plugins and 3rd party applications can be integrated with websites, including HIPAA-compliant form solutions. Having online (secure) forms makes it easy and efficient to sign up new patients, and in the long term, manage patient relationships. 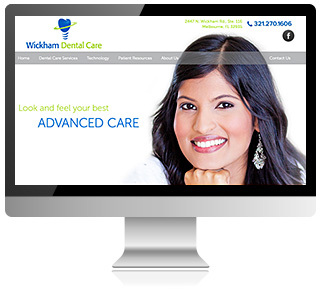 Oh, we’ve also included Responsive Web Design (RWD) with this site, so patients can easily find and read about Wickham Dental Care on any mobile device. To view this latest site, go to www.newsmile4you.com. For more information about our websites for dentists and orthodontists, go to www.martinicreative.com.